Jennifer Cluff: Teaching headjoint-only & "Right Hand on the Barrel"
Teaching headjoint-only & "Right Hand on the Barrel"
A highschool student asked a question yesterday (see next blog entry down) about a 12 yr. old who had played two years and still had very few flute skills. I answered the question with all kinds of rhythm book titles, and beginner book titles and some general advice. However, in the effort to give good hands-on advice, I made a quick video of what PHYSICAL skills can be taught to a band-flutist who needs remedial work. It includes headjoint-only work, and the very useful "Right Hand on the Barrel". The latter topic will appear in a future video as well, and originally comes from flute teacher Patricia George, who often offers teaching breakthroughs. Sorry about the clicking and clipping sound track during the flute playing---will have to fix that in future videos. Mary Byrne's handout on "Teaching the First Flute Lesson". Please have a look at my 7 min. video for novice teachers teaching novice band students. I emphasize that the purpose of the video is to give greater skills to the novice teacher; skills that I've learned from 15 years of teaching. If you don't feel comfortable with teaching these things, of course, consult with your own private teacher. I suggest that all highschool flutists who are asked to teach do so only under the guidance of a highly experienced professional flute teacher. Flute assembly to avoid repairs. Hi. Thank you for sharing this! I don`t have any experience teaching yet, but I hope I will get some students within the next couple of years. 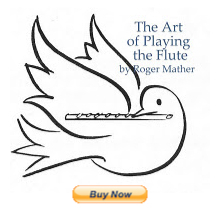 There's a great teaching book called "The Illustrated Flute Player" by Soldan & Mellersh. I highly recommend it!! It has zillions of drawings and pictures of the body language needed to play flute well. Wow! Very interesting! I always thought it was neat that you could do so much (even play 'Mary Had a Little Lamb') on just the headjoint. What a breath of fresh air for kids who are struggling in band! This video/commentary was very helpful and interesting! I have seen that Mary Byrne sheet before, and I love how lcear it is! It takes the lesson slowly, and rewards the student with a feeling of accomplishment after each step. Do you use the illustrations to emphisise your teaching to your students? Yes, I draw the same dozen flute diagrams in my student's notebooks and in pencil on their music over and over again. They're like "reminder cartoons". For most physical demonstrations, I physically, actually perform the skill, because a demo is worth a thousand words/pictures. For a good book full of illustrations that teachers and the self-teaching can use, I highly recommend "The Illustrated Fluteplayer" by Soldan & Mellersh. It's a breakthrough of a book. Can you be more specific in your question? You are a Godsend! I LOVED your video! I taught back in high school and now 20 years (ahem) later, I am trying again...after a few kids, teaching public school, etc! THank you, thank you, thank you for this and all you do!! I pledge to be more fun! PS I am using Rubank because that is what I learned on. Do you have any other suggestions? My student is 10 and total beginner/novice! Well yes, use Rubank if you think it works; but about 25 new books have come out that are tons and tons better and more inspiring and more fun!! I would use Karen Smithson's "Play the Flute" volumes 1-5 if the student was serious about fast progress.